Dead Sea Salts effectively treat many skin conditions, from eczema and psoriasis to extremely dry or oily skin. We leave these salts exactly the way nature intended, with no added colors or fragrances, so that you can relax and soak away aches and pains in our therapeutic bath salts. Unscented Dead Sea Salt is the perfect choice for those with extra sensitive skin or those who want to create their own DIY bath blends, salt scrubs, or bath bombs. 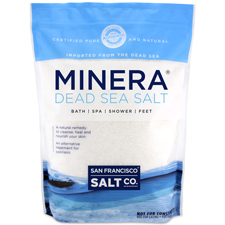 When purchasing Minera® Dead Sea Salts from us, you can rest assured you are buying the highest quality Dead Sea Salt available on the market today. Our Minera® Dead Sea Salts are imported directly from the source at the southern part of the Dead Sea. We import the salts direct from our supplier and we only import the raw, natural, unrefined salt. If your supplier cannot offer this information or provide a Certificate of Authenticity, there is a good chance that you are buying a watered-down, mineral-depleted product with little to no natural healing benefits. Buy our Minera® Dead Sea Salts, as we ensure quality you can trust. For pricing on wholesale quantities from pallet to full containers we have in stock call 1-800-480-4540 for an instant quote. The Dead Sea is known for its therapeutic properties, people have traveled to its shores for centuries to soak in the salty, majestic waters. The clean, unpolluted air and warm climate provide a healing environment that is unparalleled. Dead Sea salt is filled with natural healing elements that occur naturally in our bodies but are often lost as we go about our busy days. Soaking in water enriched with salt from the Dead Sea is known to benefit the body from the inside out, treating skin conditions and improving internal processes. You can experience the therapeutic benefits of the Dead Sea in the form of bath salts – but be careful when you choose your salts. Most of the bath salts you will find in stores are, in fact, no different than ordinary table salt. Many bath salts are treated before they are sold, and many important minerals are removed during the process. 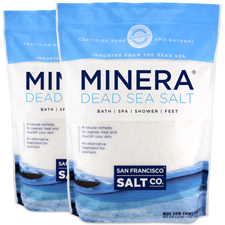 Our Minera® salts are the finest quality Dead Sea bath salts you will find. They are harvested from the Southern end of the Dead Sea, where the mineral content of the waters is at its highest. The salts are delivered to our customers in their pure, raw form, containing all the essential minerals that the Dead Sea is famous for. Our Dead Sea bath salts contain 21 minerals including magnesium, calcium, sulfur, bromide, iodine, sodium, zinc and potassium. These essential minerals naturally occur in our bodies but must be replenished, as they are depleted throughout the day. These Dead Sea minerals are known to treat, detoxify, and cleanse our bodies. As you can see, these minerals play an important role in our health and provide many benefits. Each mineral has incredible properties on its own, and powerful combinations of these minerals are known to treat and heal many common conditions. Our Minera® Dead Sea Salts are certified 100% authentic, pure and natural, and are the same salts often used in the luxurious spas and treatment centers around the Dead Sea in Israel. Minera® Dead Sea Salt has not been processed or refined here in the U.S. We sell the highest quality Dead Sea salts on the market today. Not all Dead Sea Salt is the same - IMPORTANT NOTE: It is very important to consider quality when purchasing Dead Sea salt. High quality Dead Sea salt has a high mineral content, which is known to promote amazing healing and skincare properties. However, many of the Dead Sea salts on the market today have been processed, mineral depleted, or blended with another salt to produce a salt that is far inferior to the real natural Dead Sea salts. BEWARE - MANY FAKES FOUND ON eBay/Web. Please read our Salt Blog regarding our findings after testing so-called "Dead Sea salts" sold on eBay. For more information see Dead Sea Salt resources.